Approaching the midpoint of meteorological winter, there have been only 5 days so far with temperatures cooler than average in Washington. 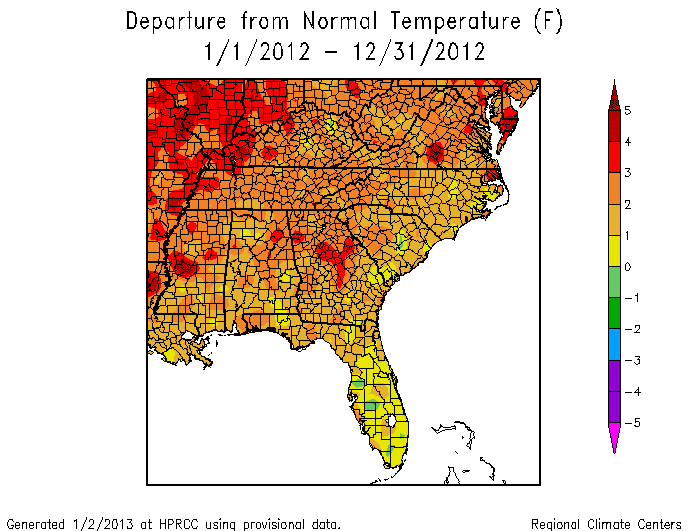 As the 2013 inauguration approaches, however, it's likely that colder temperatures will prevail. The latest extended outlook from the Climate Prediction Center for January 20-26 (click to enlarge) shows a 40% or higher probability of colder than average temperatures for the Mid Atlantic area. Precipitation chances, however, are rated at 40% or higher to be drier than average. The table above shows that the trend to cooler temperatures has been common at this point in the winter in recent years, as temperatures have tended to be near or below normal on January 20 and 21. The warmest maximum temperature on each of the 2 days for the 4 years beginning with the last inauguration in 2009 was 44°, just 1° above the long-term average. In each of the last 3 years, there has been at least a trace of precipitation. Some of this fell as snow on each occasion, although the largest amount was 0.6" on January 21 last year. Midnight Update: The standard deviation of the U.S. annual average temperatures is 0.92, so the new record exceeds the old one by over 1 standard deviation. It's also more than 3.4 standard deviations from the average. According to a public domain table of the normal distribution, the odds of this are 0.0003369. If the distribution were truly random (hint, it ain't), this would be a once in 2968 year event. The National Climatic Data Center's preliminary report, released within the last hour, confirms that 2012 was the record warmest year for the U.S. by an incredible margin of 1.0°F. All 48 contiguous states were warmer than average for the year, 19 had record warm years, and 26 more had top 10 warmest years. At least 356 individual locations tied or broke their all-time record high temperatures. This included at least one location in every state except Washington. 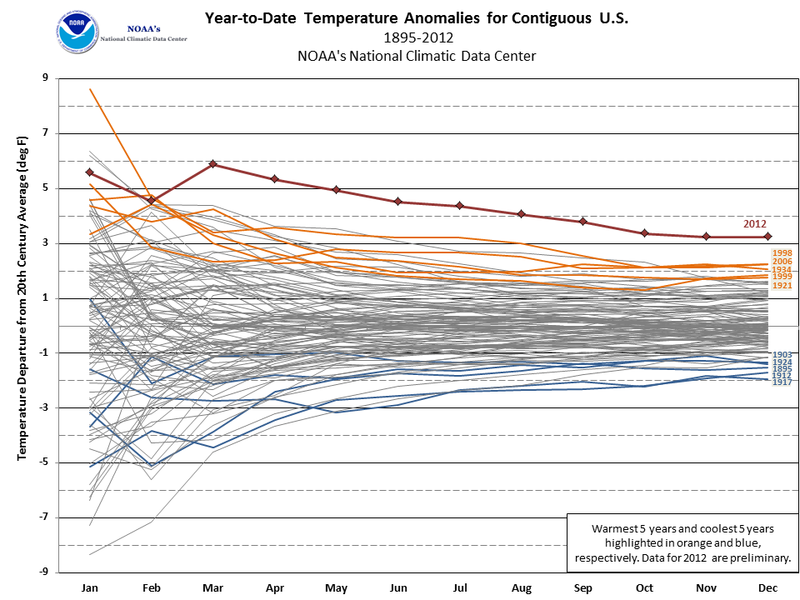 The NCDC chart of year-to-date temperatures (click to enlarge) to the right shows that the extremely warm January and March put 2012 firmly in first place for warmest year and the wide margin was maintained through December. 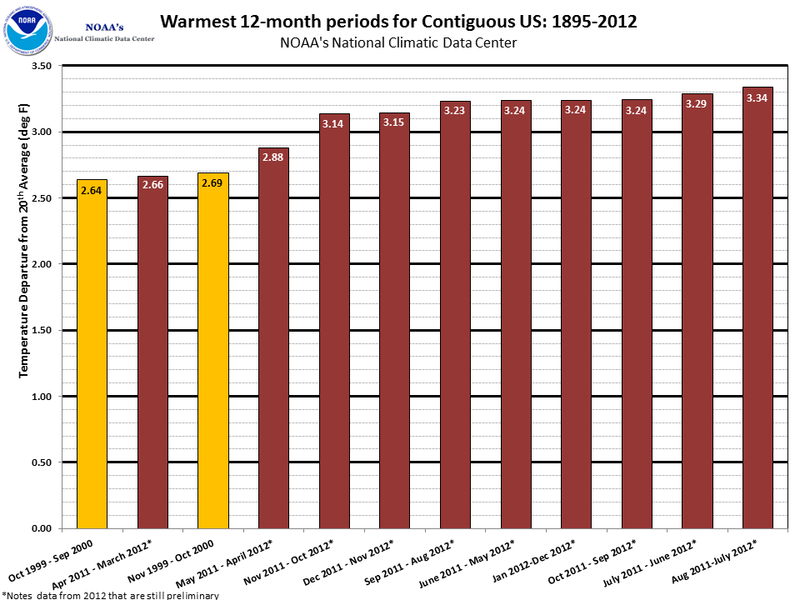 The chart of warmest 12-month periods shows that 10 of the top 12 ended in 2012. In 2012, the contiguous United States (CONUS) average annual temperature of 55.3°F was 3.3°F above the 20th century average, and was the warmest year in the 1895-2012 period of record for the nation. 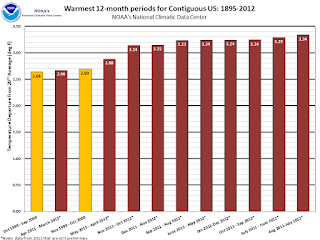 The 2012 annual temperature was 1.0°F warmer than the previous record warm year of 1998. Since 1895, the CONUS has observed a long-term temperature increase of about 0.13°F per decade. On a statewide and seasonal level, 2012 was a year of both temperature and precipitation extremes for the United States. Each state in the CONUS had annual temperatures which were above average. Nineteen states, stretching from Utah to Massachusetts, had annual temperatures which were record warm. 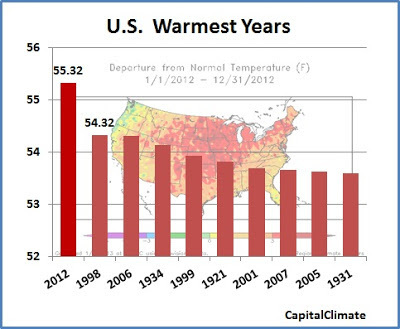 An additional 26 states had one of their 10 warmest years. Only Georgia (11th warmest year), Oregon (12th warmest), and Washington (30th warmest) had annual temperatures that were not among the ten warmest in their respective period of records. AVERAGE TEMPERATURE OF 75.3 DEGREES WHICH OCCURRED IN 1990. AVERAGE TEMPERATURE OF 76.6 DEGREES WHICH OCCURRED IN 1994. The year 2012 had an average temperature of 69.9 degrees, which was 2.1 degrees above normal. This ties with 1998 for the 2nd warmest year on record in Tallahassee, behind only 1949 which had an average temperature of 70.1 degrees. The coldest temperature of the year was 18 degrees on the morning of Janaury 4th. This tied the record low for the date. No other daily record low temperatures were recorded for the remainder of the calendar year. Freezing temperatures were observed on only 15 days this year. The last freeze of the 2011-2012 season occurred on Valentine's Day. This is about a month earlier than usual. 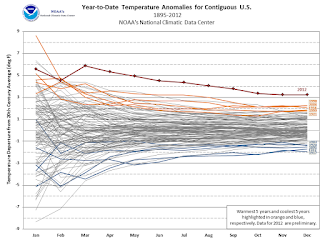 2012 average temperatures were above normal for the year by 1 to 2 degrees (which was the 2nd warmest on record at Alma and St Simons Island across SE Georgia), these were set in motion by the well above-normal readings the first half of the year. ON THE PERIOD 1981-2010...THE NORMAL ANNUAL VALUE IS 58.9 F.
TEMPERATURE DATA AND 1881 FOR AVERAGE TEMPERATURE. ON THE PERIOD 1981-2010...THE NORMAL ANNUAL VALUE IS 60.2 F.
TEMPERATURE RECORDS AT NORFOLK DATE BACK TO 1874.